Quick question, I'm a newbie to the Affinity Designer Software. I want to create a text portrait (see image example below) but I am not seeing any tutorials on Youtube. Any tips? And can it be done on Designer or do I need to purchase Affinity Photo? Just follow that PS video you took the image from, it's pretty much the same in Affinity products. In Affinity Designer you can do this too, there you just work out the image/portrait finetuning part in the Pixel persona. This certainly can be done on Designer using a mixture of the Draw and Pixel personas. 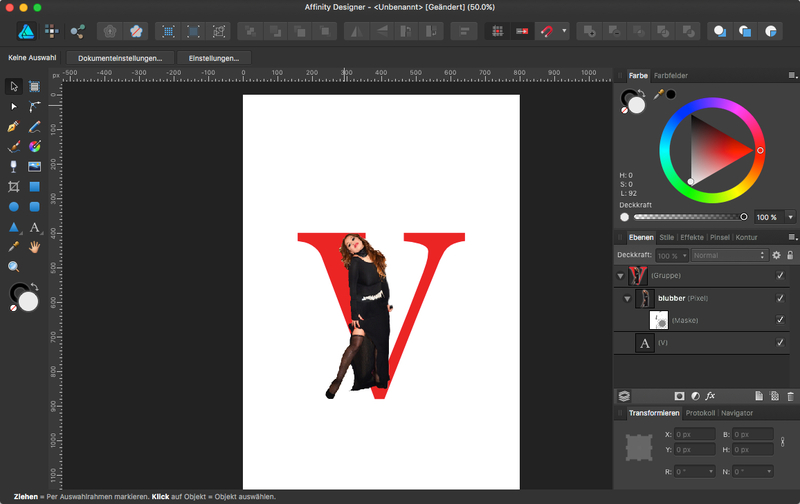 Then, insert your model image and remove the background from the image using your preferred method, such as the Smart Selection brush available in Pixel persona. Select the mask only and check that you are still in Pixel persona. Use the paint brush tool with a black fill to 'paint' on the mask, masking some of the image to the edge of the text. This will automatically clip to the edge of the text, so no need to worry about being precise. Thank you both so much! I know where I went wrong now after seeing your screenshots Dan C.
I am going to try it now.